Our fair city is more than 11,000 kilometres from poor, benighted Bangladesh. But Monday, the teeming flood plain came to the doorstep of The Bay in the heart of downtown Vancouver, through the glass doors and up the escalator to the second floor. 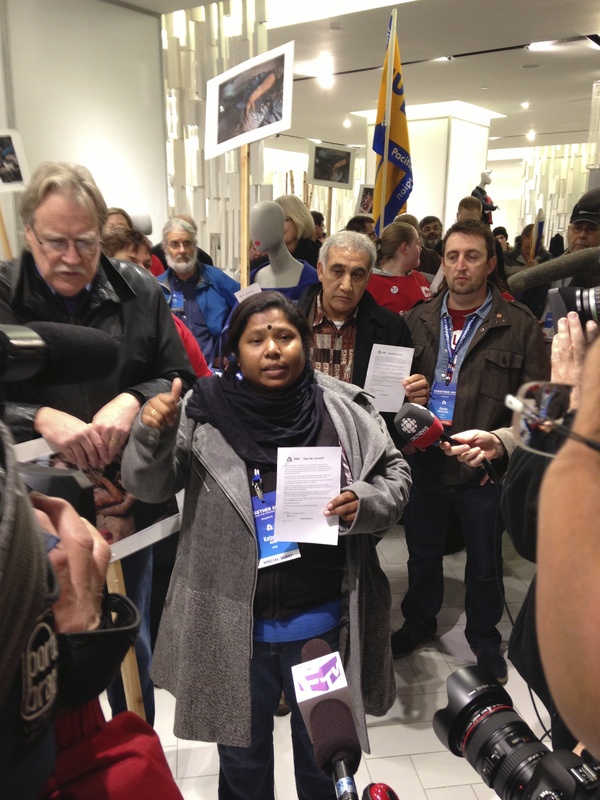 There, close to a hundred union protesters gathered in front of the store’s swank, high-priced merchandise, serenading shoppers, mannequins and suddenly-invisible Bay managers with chants of “Shame” and “Sign the Accord”. Their ire was directed at far-away Bangladesh, and Western retail chains like The Bay, who peddle clothing items produced by impoverished, poorly-paid, Bangladeshi textile workers toiling in grim, frequently dangerous factories. The Accord protesters demanded that The Bay sign is far from a radical document. It merely commits signatories to ensure enforcement of a safe working environment for employees who work in those notorious sweatshops on our shopping behalf. The situation has taken on pressing urgency since the calamitous collapse earlier this year of the eight-story Rana Plaza building, which killed more than 1,100 textile workers. Many had wanted to stay away that day, after noticing ominous cracks in the walls. However, they were threatened with being fired or losing pay by unscrupulous bosses, who assured them the building was safe. 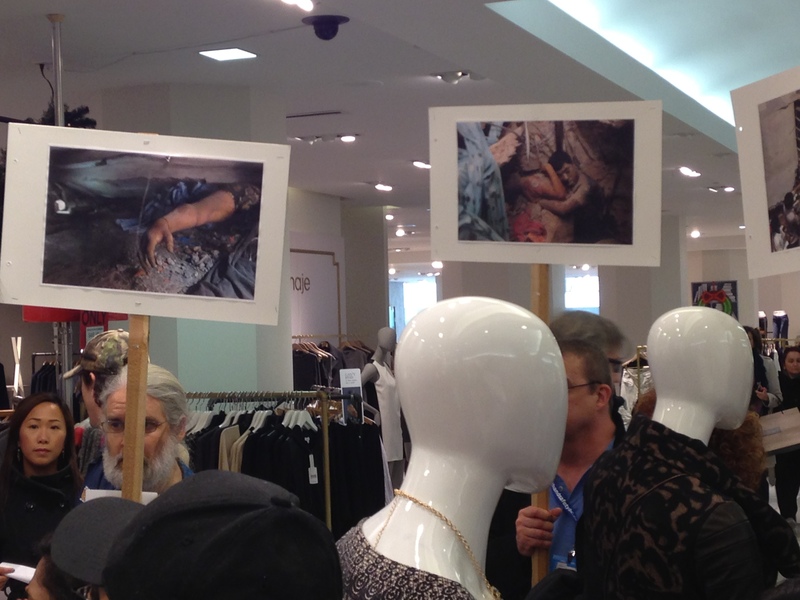 At least one Canadian retailer was among those with contracts for garments from workplaces in the Rana Plaza. Since then, more than a hundred retailers across Europe and North America have signed the legally-binding Accord on Fire and Building Safety in Bangladesh. On behalf of its Joe Fresh clothing line, Loblaws has signed. The Bay hasn’t. Instead, The Bay, along with Walmart, Canadian Tire and others, have opted for a lesser safety agreement that does not provide for independent, on-site, factory inspections. In the midst of demonstrators at The Bay was 36-year old Kalpona Akter. She became a textile worker at the age of 12, was fired four years later for trying to organize a union, and today heads the Bangladesh Centre for Worker Solidarity, based in Dhaka. The post-collapse reaction of most Canadian retailers doing business in Bangladesh has not been encouraging. While there is now grudging recognition something needs to be done about the miserable working conditions that provide our fancy duds, the general corporate response has been to do as little as one can publicly get away with. Lets face it. Competition in the retail trade is fierce. The cheaper one can get products from desperate countries like Bangladesh, the better. For millions of mindless, brand-obsessed shoppers, price is key. Who cares what it takes to land those snazzy clothes on store hangers? How many Black Friday shoppers will give it a moment’s thought? Retailers may well think: we can’t afford to have a conscience. Why should we sign the Accord, if my competitor isn’t signing? But surely, some executives somewhere must also be capable of thinking: if the cost of doing business involves the kind of textile-production atrocities we see in Bangladesh, is that production we want to be part of? Surveys have shown Canadians are willing to pay more for garments produced by workers with rights in a safe environment. Yes, easy to answer a poll question, but it’s hard to imagine consumers not responding to a solid advertising campaign extolling a retail chain’s social responsibility. For the moment, there are no calls for a boycott of The Bay. Rather, Canadians are being urged to put their names to a petition urging the company to sign the Accord. Seems like the least people can do. They can also send personal messages to Bay biggies, telling them to do the right thing. A shining example is right before them. H&M, the Swedish-based second-largest clothing retailer in the world, pledged this week to guarantee workers producing its garments at factories in Bangladesh and Cambodia are paid “a living wage”. If H&M, why not others? As she talked to the media on The Bay’s glitzy second floor, Kalpona Akter noticed she was standing in front of a blouse priced at $350. “It would take a worker back in Bangladesh six months to earn that much money. It’s shocking,” Akter said. I’m sorry, I can’t resist putting this beautiful, auto-biographical piece by Rosanne Cash on my blog. It needs a bit of class. Hehe. 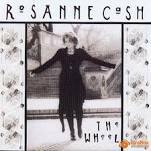 I have been a fan of Rosanne Cash for 30 years. Her music is truly memorable, and, depending on the song, it will break your heart. I finally saw her live for the first time in Paris, of all places, at a strange, large night club, where I sat with some people who’d barely heard of her. Still, it was a real thrill. This was the spring of 1990. Her husband Rodney Crowell performed, too. And I remember thinking there seemed something off between the two of them. Of course, we learned later that the couple was in the midst of breaking up. Her subsequent, introspective album, The Wheel, certainly seemed to touch on that time in Paris. A song on the album is specifically titled, Sleeping in Paris, and the cover photo was taken in the City of Light. A few years ago, Rosanne Cash performed at the Vancouver Folk Music Festival, including an unforgettable appearance at a workshop, where she swapped songs with the other participants, as casual and down-to-earth as everyone else. Later that night, on the main stage, she made some humorous, disparaging remark about her husband, John Leventhal. We were close to the front, and when my wife Lucie added, loudly, “But in a good way…”, Rosanne Cash responded: “In a very good way…” True love, even among the gods. 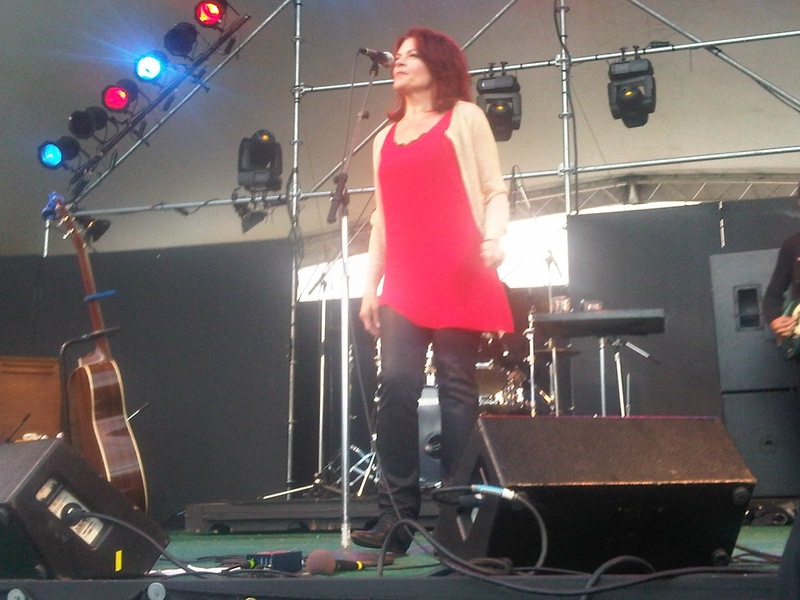 Here’s my Blackberry photo of the divine Rosanne Cash on the main stage of the Vancouver Folk Music Festival, 2011. 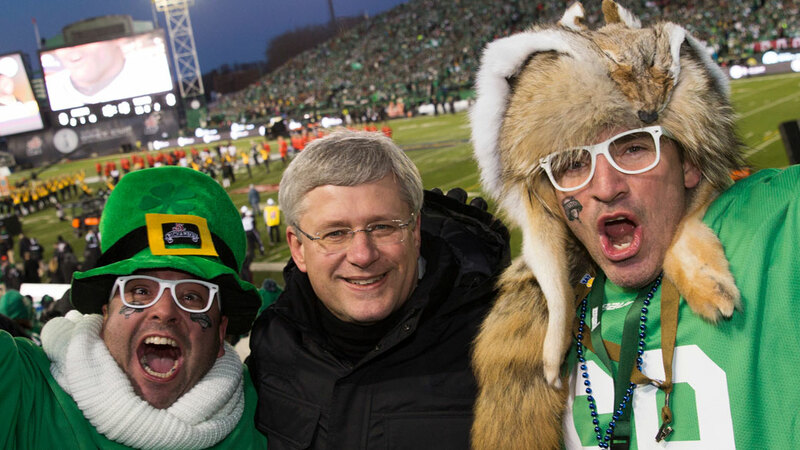 Canadian Prime Minister Stephen Harper gets up close and comfortable with his latest choices for the Canadian Senate. 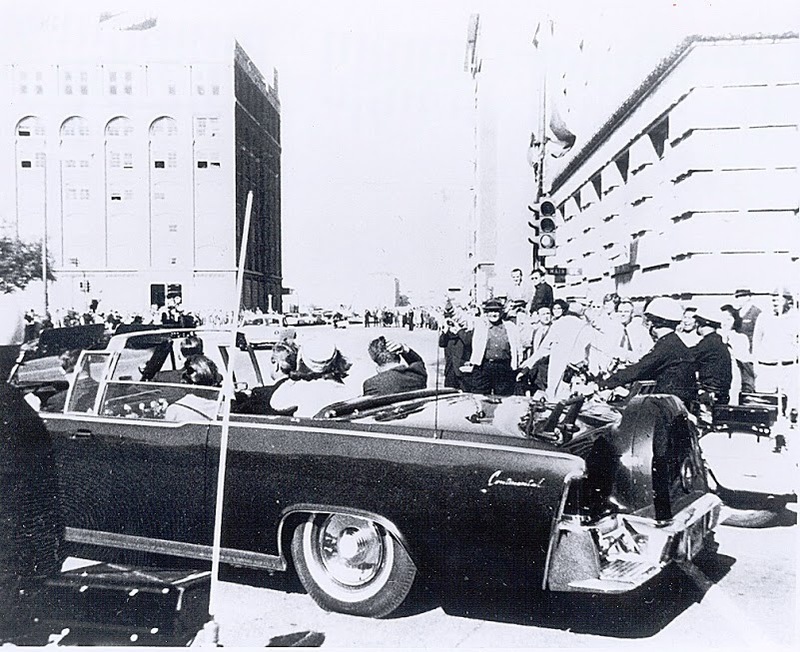 I’m certainly old enough to have an answer to the perennial question: where were you when you heard JFK had been shot? But for me, the news unfolded in a strange mixture of whispers and hearsay. I was ensconced at Newmarket District High School. We were writing exams. The principal, in his great wisdom, thought it better that we not be sidetracked from our weighty, academic endeavours with word that the President of the United States had been assassinated. So there was no dramatic announcement over the PA, no weeping teachers giving their students the shocking news from Dallas. Instead, all we got as we prepared to head home that unforgettable afternoon were corridor rumours of an event that seemed impossible to believe. Only when a bunch of us gathered around a student with a transistor radio did we know for a fact that the rumours were true. John Fitzgerald Kennedy was dead. Beyond the terrible tragedy, itself, what jarred me most was simply hearing the word “assassinated” applied to JFK. These were the 1960’s. In my mind, assassinations were something from the history books, befalling mustachioed figures in gaudy military uniforms like Archduke Franz Ferdinand, or the obscure President McKinley, gunned down in Buffalo at the turn of the century. Assassinations had no place in my world, in 1963. Of course, that sentiment would prove even more naïve as the rest of the violent sixties unfolded to the south of us. Those days were such a relatively innocent time. A leader like Kennedy could still inspire, without being drowned by cynicism and nattering nabobs of negativism. He was the last American president to be admired around the word, and the outpouring of sorrow on his death will likely never be matched. A young, charismatic, vigorous president cut short in the prime of life. As much as we mourned for him and Jackie, Caroline and John-John, we grieved as well for the loss of so much unfulfilled promise. After a rocky start to his presidency, when he seemed almost overwhelmed by the weight of office, Kennedy had found his sea legs. There would be no more fiascos like the Bay of Pigs or dithering on civil rights. Although we will never know what he would have done in Vietnam, Kennedy was becoming more and more of a peacenik, talking up disarmament, fostering increasingly warm ties with Khrushchev and pushing for a treaty banning nuclear tests in the atmosphere. On civil rights, as freedom marchers in the south were clubbed, set upon by dogs and murdered, Kennedy, who had cynically voted against Eisenhower’s mild Civil Rights Act in 1957 to avoid antagonizing southern Democrats ahead of his run for the presidency, had started to move forcefully against segregation. He delivered a powerful speech pledging government support to enforce racial equality. His television address was lauded by Martin Luther King as “one of the most eloquent, profound and unequivocal pleas for justice and the freedom of all men ever made by any president.”. A few months later, Kennedy introduced his own, tough Civil Rights Act, also endorsed by Martin Luther King, which was finally forced through Congress by LBJ in 1964. That was the thing about Kennedy. Not that he was a great president. But that he was showing so many signs of becoming a great president, one who seemed serious about waging peace and making the world a safer and better place to live. Okay, it’s not the spectacular roiling surf and miles of wonderful, hard sand that make Long Beach such an extraordinary experience, but it’s a treasure, nonetheless. I’m talking about one of the best short hikes beautiful British Columbia has to offer, the Wild Pacific Trail on the ocean outskirts of the one-time loggers’ bastion of Ucluelet. For years, when the woods were still producing their great bounty, the hard-living, hard-working folks of Ucluelet sneered at the laid-back softies of rival Tofino, who abandoned industry for eco-tourism and the like. But Tofino could see the future, and it wasn’t logging. 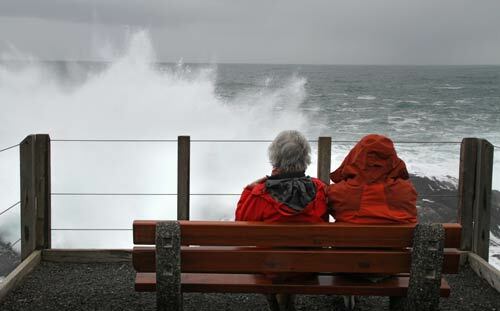 Now Ucluelet, devastated by the downturn in forestry and fishing, has seen the light, too. Bed and breakfasts, high-class resorts, whale watching and all those other touristy things are on the rise. But nothing tops the Wild Pacific Trail. There is no Long Beach on the shores of Ucluelet. Instead, powerful breakers of the open ocean hurl themselves at reams of jagged, ridiculously menacing rocks. Sometimes, the waves simply go beserk. An early lighthouse was wiped out during a fierce storm, and not that long ago, a huge cache of driftwood was tossed far inland, as if the logs were made of paper mache. The well-constructed trail has several different routes, but the 45-minute Lighthouse Loop, to and from the famed Amphitrite Lighthouse, is special. A wide pathway, viewing benches seemingly around every bend and close-ups of the rugged, wave-splattered coastline and offshore Broken Group Islands make the path a true delight. Although the winds were relatively calm when I was there last weekend, vistas are said to be at their absolute best when a good old West Coast storm lashes the sea into a fury. The Wild Pacific Trail is the result of a singular vision by longtime Ucluelet resident Oyster Jim Martin, who finally got the community to take his dream seriously and pitch in, when the forest industry began to go south. The result is wonderful. So, do yourself a favour the next time you’re at Long Beach. 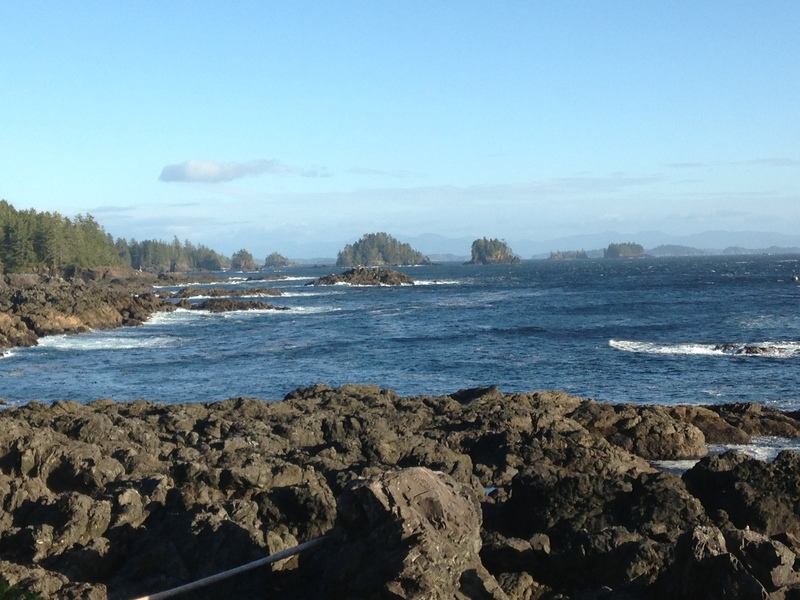 Make a side trip to Ucluelet and take a walk on the wild side. 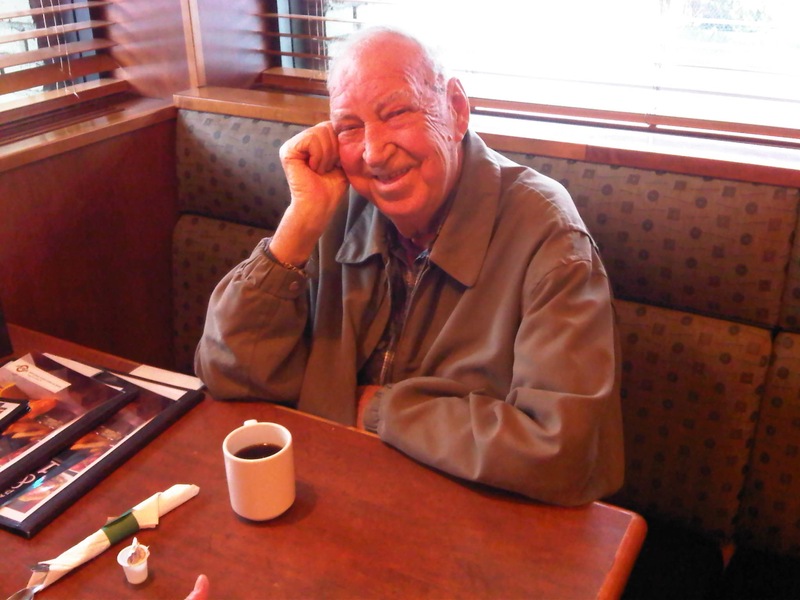 I talked with Big Jack Munro a few days before he died. It was pretty tough going. The big booming voice that had bellowed from the podiums of hundreds of meetings was down to a whisper. His legendary fire was just about spent. But some things had not changed. His endearing, infectious chuckle was still in place, despite the pain of his illness. And, 40 years after I first covered him for the Vancouver Sun, Jack was still calling me Rob. I will write more about Jack Munro, and in particular his controversial role that dramatic Sunday night in Kelowna almost exactly 30 years ago, when Bill Bennett, the premier of the province, and Munro, a union man, met face to face in the premier’s living room to hammer out an end to the very real threat of a general strike. It was as dramatic a moment as it gets, even in B.C., and arguments still rage today about the pros and cons of their so-called Kelowna Accord. But for now, let’s hear from Jack Munro, himself. These observations by Brother Munro are from an interview I did with him just last August for a story on the relatively sad state of the B.C. labour movement. Whatever one’s thoughts on Jack Munro, and he was not “the good guy” on every issue, no one can deny his commitment to the cause of working people, and his genuine sorrow and anger at the decline of union influence. It’s all here. MUNRO: Everybody delights in kicking the hell out of the labour movement. It’s having a tough time. Everybody’s struggling. The world is somewhat upside down. I think we’ve lost some really important values. Too many people have forgotten that it was the labour movement that was able to bring about changes in our society, in our way of life, in our social consciousness. But we’re no longer headed up, we’re headed down. You listen to these commentators. Every damn thing that goes wrong, with wages and whatnot, they blame the workers. Cut the workers’ play, cut this, cut that, cut the benefits. If workers get money, they spend it. They buy things. They keep our economy going. And to drive the bloody people that keep it going down to the bottom is absolute insanity. MUNRO: Society is a helluva lot worse without unions. Absolutely. But I don’t know what the hell’s happened. Maybe unions have been too acquiescent. They don’t get any awards for that. The economy is this and that, so they go a couple of years with no wage increase, or 1 and 2 per cent, and the bosses think that’s just great. So they concentrate even more on keeping wages down. They think, ah, we’ve got ‘em now. They pile on. It’s very frustrating for a guy like me, very frustrating. MUNRO: Leading a strike is tough. When the IWA went on strike, all the staff went on strike pay, too. So we had the same hardship as the members. It’s emotional. You lie awake at night. You know people are hurting, but you can’t give up. If you give up, it’s going to be worse. You have to keep on. MUNRO: We’re trying to get more worker-type history into the schools. Right now, there’s nothing teaching kids in school about how the hell we got here. Governments and entrepreneurs encouraged expansion and development. They opened the doors. Workers walked through and did a hell of a job, developing industries and systems and that sort of stuff. But nobody’s being taught that. So with our Labour Heritage Centre we are trying to remind people and society that workers have made an important contribution. If no one knows something, they don’t understand it. If unions don’t come back, society is in big trouble. Amen, Brother. It’s hard to believe he’s gone. My old colleague Doug Ward, like myself an ex-labour reporter who covered Jack Munro, has written a good synopsis of his turbulent career. The Agricultural Land Reserve is one of those magical creations that materialized because of courageous, far-sighted, politicians, who thought beyond votes and the next election. The province’s first NDP government, under Dave Barrett, established the ALR 40 years ago, because they believed it was the right thing to do, at a time when prime farmland was being gobbled up by developers at a terrible rate. There was virtually no precedent anywhere for banning such a vast expanse of agricultural land from being sold for non-farming purposes, and the Barrett government had to weather a storm of furious protests from farmers, developers, and political opponents. But a funny thing happened on the way to wiping out the NDP’s radical proclamation, once the “socialists” were thrown out of office. The public liked the ALR, and, over time so, too, did farmers. 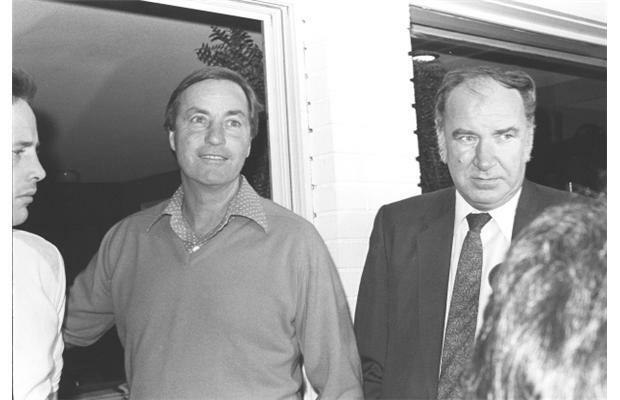 When Social Credit leader Bill Bennett was campaigning to unseat the Barrett government in 1975, he found it politically prudent to promise not to dismantle the Agricultural Land Reserve, despite his party’s earlier, fierce opposition. In a wonderful twist of fate, Richard Bullock, the current chairman of the Agricultural Land Commission that presides over the ALR, was one of those protesting outside the legislature against the NDP’s farmland freeze. Now, out of nowhere, with no hints by the Liberals during the recent provincial election, the ALR may be facing its gravest peril since it came into being in the 1970’s. Energy and Mines (!) Minister Bill Bennett, who has rarely seen a government regulation he likes, is presiding over a “core review” of government services, which, for some reason, also includes the Agricultural Land Commission and the ALR. 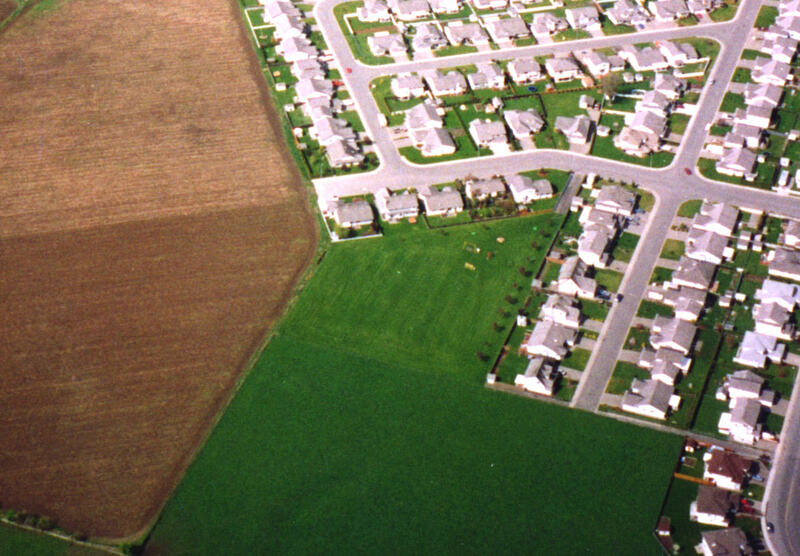 Last August, Bennett demonstrated his grasp of the issue with his provocative observation that “people who are sitting on a piece of land that is covered by rocks and trees, land that should never have been in the ALR boundaries in the first place, are constantly being turned down when they want to use their own private land…for the purpose of maybe a small subdivision, or maybe they want to put a small campground on it, and they’ve been flummoxed by the land commission for years.” The minister provided no examples of ALR land “covered by rocks and trees”. Talk about the fox in charge of the henhouse. Recent disclosures are even more worrisome. Last week, the Globe and Mail’s Mark Hume revealed the existence of frightening cabinet documents that propose a dismantling of the ALC as an independent body and changing its mandate to include the government’s “economic priorities”, as well. Then, we learned, again courtesy of the redoubtable Hume, that none other than the Agriculture Minister himself, Patrick Pimm, had personally lobbied the ALC to have a chunk of farmland up by Fort St. John hived out of the ALR, so its owner could build some rodeo grounds. Pimm was properly rebuked by the ALC for his political interference in the affairs of an independent commission. The Liberals seemed to understand that principle in those halcyon, pre-election days last March, when they were desperate to keep the guns blazing against the NDP and its leader, Adrian Dix, who, yes it’s true, lobbied the ALC on behalf of then-Premier Glen Clark to have the Six Mile Ranch taken out of the ALR back in the late 1990’s. The Liberals further trumpet their budget commitments to bolster enforcement by the ALC and support its “increased oversight” of the ALR. Wait, there’s more. The same budget increase will also enable the ALC to “continue with East Kootenay boundary review”, the document noted. Oh, well. That was so eight months ago. What have we today, now that the election is safely passed? The core review that seems to go against everything in the Liberals’ March “information resource” is continuing full steam ahead, Mr. Pimm remains Agriculture Minister, the owner of the ALR land he lobbied for went ahead and built his rodeo grounds anyway, defiantly daring the ALC to do something about it, and the ALC’s East Kootenay boundary review has been halted in its tracks, pending the vaunted core review. For those concerned about the fate of the precious Agricultural Land Reserve under the post-election Liberals, these are worrying times, indeed. Be afraid. Be very, very afraid.